We received a call last week from a customer who was noticing some discoloration in his wall. 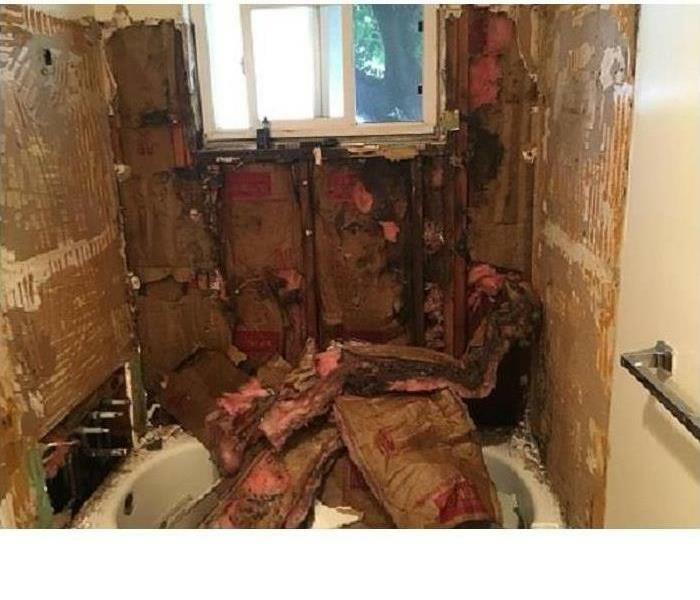 He wasn't sure if it was water damage and requested an inspection. He wanted SERVPRO to come out before they got mold. Primarily we use non-intrusive moisture meters to detect water damage. The advantage of this type of moisture meter is that it does not physically damage the materials that it is testing. This is compared to some moisture meters that use metal probes that pierce the object being tested. Our inspection revealed that not only was his wall cavity affected, but a fair sized amount of flooring. 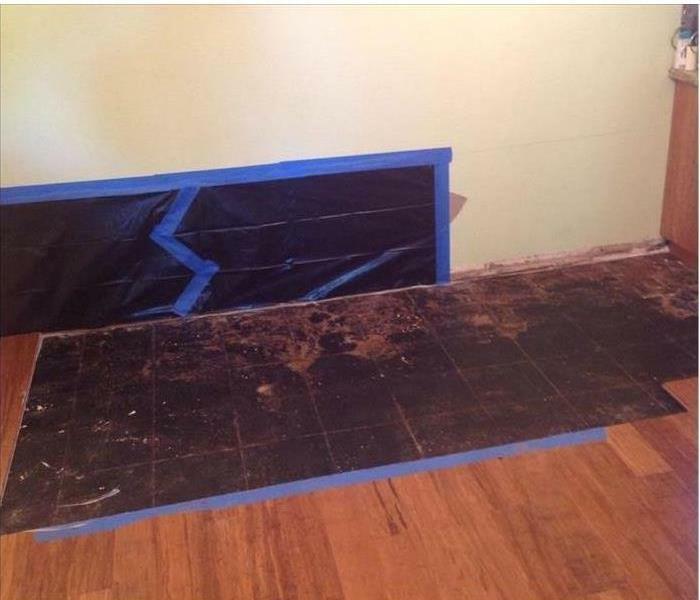 Look in the photo how we found another layer of tile below the floating floor. Customers are often surprised to find one, two, or sometimes even three old floors under a laminate floor. This week a customer telephoned us to report that her kitchen hardwood has been gradually discoloring over several months, in particular over a high traffic area. They were at a loss as to what was causing the discoloration. 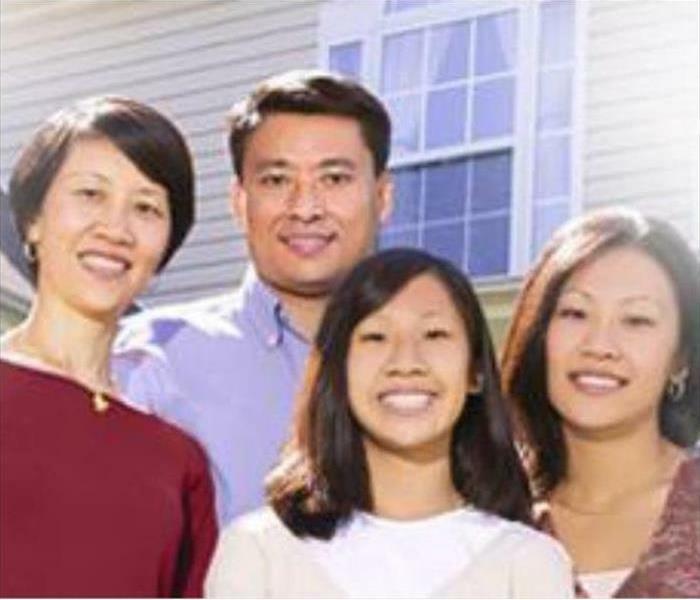 They contacted their insurance agent and he suggested to call us for a no-obligation inspection. We sent out a technician who performed a moisture mapping of their floor. He determined not only was there water present under the floor, but also under the carpeting of the family room that is located adjacent to the kitchen. Our tech carefully peeled back the carpeting to discover a crack in the customer's concrete foundation where water was emanating from. No customer ever wants to hear the news there is a crack in their foundation - but boy was she relieved to finally know the cause! Property Managers & Real Estate Agents: Ever run into a mold problem at one of your properties? Do you want to learn more about how to prevent a mold problem and how to handle one if it already exists? Understanding Mold in the Restoration Industry is a 3-hour CE course taught by SERVPRO and designed for Real Estate Professionals. The purpose of this course is to educate Real Estate professionals on the real effects of mold growth in residential & commercial structures. Mold growth requirements will be reviewed so the real estate professional can recognize potential mold dangers in real property. SERVPRO gives CE classes about restoration every year. SERVPRO of SW San Jose can help Real Estate and Property Managers with mold or water damage. SERVPRO of SW San Jose welcomes opportunities to educate our community about fire, water, and mold damage restoration topics. 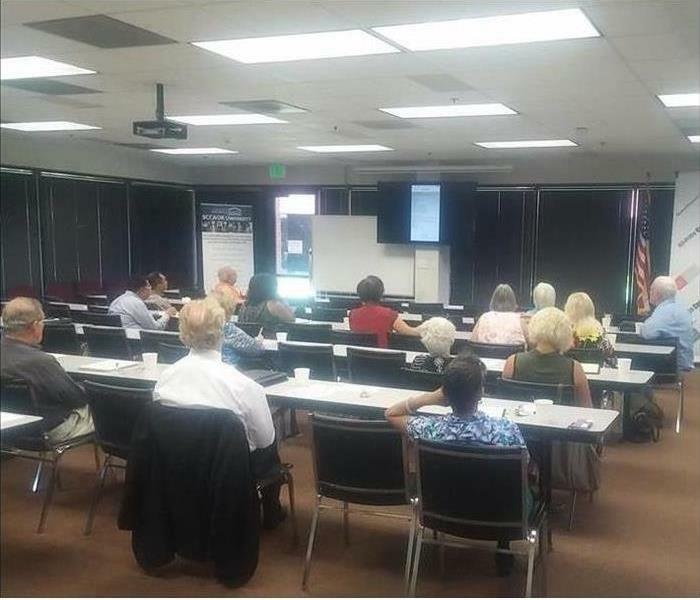 Recently our marketing manager spoke to real estate agent members of the Independent Broker's meeting at the Santa Clara County Association of Realtors (SCCAOR). SERVPRO also gives classes to property managers. SERVPRO gives real estate agent and property manages the tools to help them and educate them to know more about water, fire and mold damage. SERVPRO of SW San Jose takes care and helps out a lot of property managers in the area with water damage as well as mold and fire damage. Selling a house is a hard thing but when the real estate agent needs help taking care of a mold damage we are here to help them out. SERVPRO will clean up anything!! 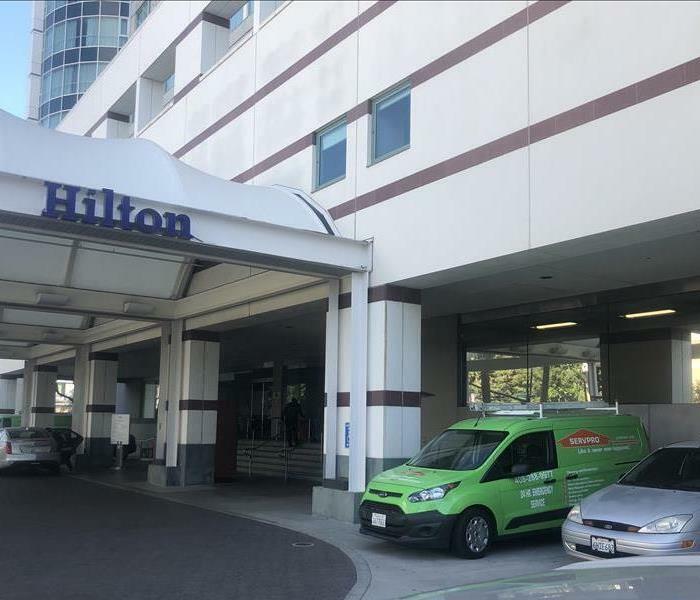 One of our property management clients called SERVPRO of SW San Jose because he was evicting a problem tenant who caused his apartment to become overwhelmed with roaches. The pest control company had already treated the unit on a few occasions, but now they have a serious bio-hazard cleanup on their hands. He told us he contacted a few janitorial companies for quotes but they would not even attempt to bid the project because of the potential health hazards. SERVPRO of SW San Jose crews have the expertise and materials to handle just about any bio-hazard cleanup project. Should you run into such a situation, give SERVPRO of SW San Jose a call for your free estimate today. We will take care of the job from beginning to end. SERVPRO of SW San Jose will take care of the dirty work for you. Just call us and we will help out, and leave it "Like it never even happened." Working to help a customer in Los Gatos deal with a leaking wax ring from a toilet. 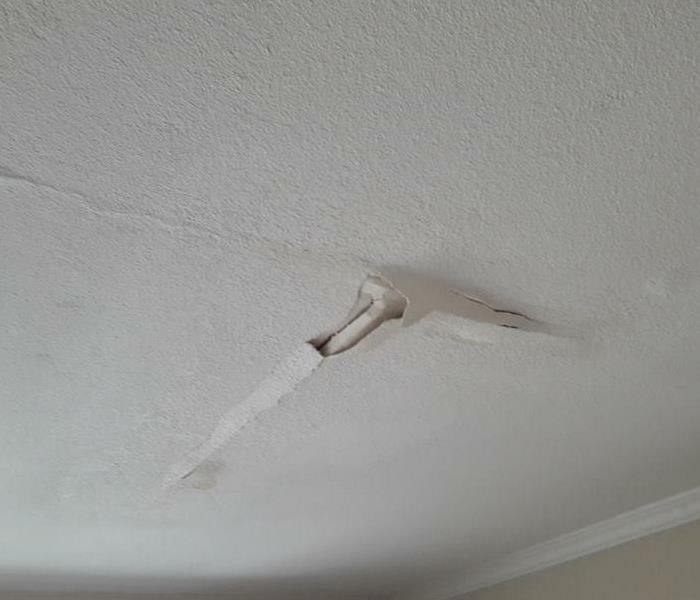 They saw a gradual widening of discoloration in a ring pattern in the vinyl in their upstairs bathroom - then one day this nasty spot appeared on their hallway ceiling below! Luckily for them the amount of sewage was small and we were able to catch it in the initial stages. We performed their water damage cleanup and sanitized the affected areas. Customers often ask us if there is anything they can do to help prevent this type of damage. The best advice in this instance would have been to investigate the vinyl discoloration in the upstairs bathroom at the very beginning. Frequent inspections are often a good way to prevent leaks. NCAA March Madness 2019 is here! It's that time of year again, time for March Madness! Eligibility: Must be a SERVPRO of SW San Jose Partner (owner, agent, agent staff, property mgr, realtor, broker, or employee). ENTRIES MUST BE COMPLETED BY THE TOURNAMENT 9AM PST 3/1/16. THERE IS NO COST OR OBLIGATION TO ENTER. One entry per person. Contest rules are listed on the website. Good luck from your Fire, Water, and Mold Cleanup & Restoration Experts…… SERVPRO OF SOUTHWEST SAN JOSE!! Ways to reduce water damage! Whether due to lack of attention or a freak accident, all homeowners at one point or another experience some type of water issue in their homes. And in many cases, the problems present themselves in subtle ways. The key is to be on the lookout for them so that they don't become a matter that requires a significant amount of time, money, and effort to fix. 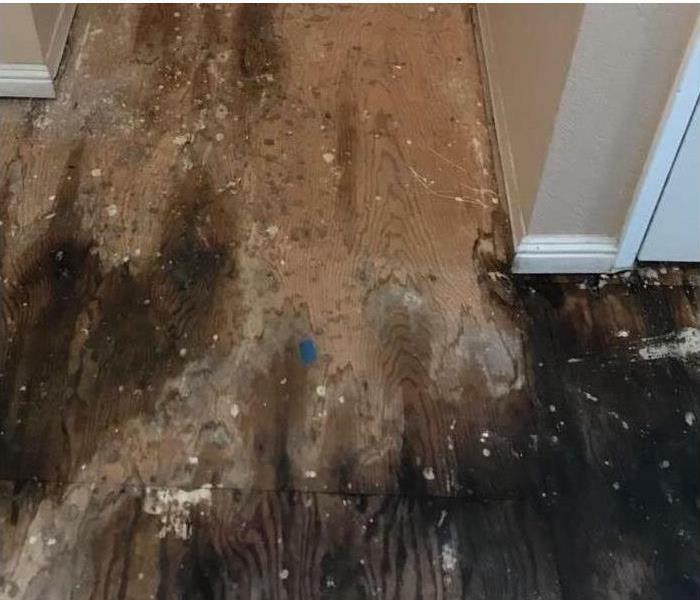 With this in mind, the Insurance Institute for Business and Home Safety (IBHS) chronicled the five leading causes of water damage based on property insurance claims. In addition, they outlined the potential indicators of a problem and tips on how homeowners can solve them. Potential indicators of a plumbing problem include an increased monthly water bill, banging pipes, rust stains, and moisture in the walls or on floors, and signs of wet soil erosion near the foundation. Toilet failures in the IBHS study cost more than $5,500 per incident after the deductible was paid. One-third of all toilet failures in the study resulted from an overflowing or clogged toilet. After you flush, wait for the valve to completely finish refilling the tank and bowl. If an overflow looks imminent, turn off the supply valve. Twice a year, inspect a toilet’s components, such as the fill, supply and flush valves and the supply line. Consider upgrading the toilet’s supply line to a sturdier braided steel hose. The most common causes of water heater failures in the IBHS study were a slow leak or a sudden burst in the tank, followed by supply line failures. The average cost per incident was $4,444. Proper maintenance, such as flushing sediments and inspecting the heater’s anode rod, can increase life expectancy. Inspect valves to ensure proper operations, and use ball valves in place of gate valves whenever possible. The IBHS study found more than half of plumbing system failures were the result of sewer backups. The problem was more common in southern states and on average cost $4,000 per incident after the insurance deductible was paid. If the home’s sewer system is connected to the city’s sewer system – a particular problem for older homes – or if you are located downhill or below street level, contact a plumbing professional to install a backflow prevention assembly into the home’s sewer system. Plant trees away from lateral drain lines to prevent roots from damaging piping. More than half of the claims in the IBHS study were linked to washing machine hose failures. Washing machine claims in the study averaged more than $5,300 per incident after the deductible was paid. Nothing can completely prevent water damage incidents. But you can reduce your risk by taking some precautions. Helping out the Bay Area!! Downtown San Jose, helping out local business. Many of our customers know that we do residential water mitigation work, but not as many know we serve businesses both large and small. Last year was supposed to be the El Nino year, but this season we've received a record number of water and mold damage phone calls for residential & commercial buildings alike. We are located conveniently off Capitol Expressway and Highway 87, making it easy to serve your downtown business. In particular with water damage, a quick response is critical. The longer water is allowed to dwell, the more damage it can cause and the longer your business could be inoperable. SERVPRO offers an Emergency Ready Plan (ERP) that can be a part of your company's overall Disaster Plan, something both FEMA and the Red Cross recommend every business have. If you have questions about how SERVPRO can help you with your company's ERP, contact Nancy Penaloza at SERVPRO of SW San Jose. Working to help a customer in Los Gatos deal with a leaking wax ring from a toilet. They saw a gradual widening of discoloration in a ring pattern in the vinyl up their upstairs bathroom - then one day this nasty spot appeared on their hallway ceiling below! Luckily for them the amount of sewage was small and we were able to catch it in the initial stages. We performed their water damage cleanup and sanitized the affected areas. 3/29/2019 - SERVPRO that is Why!! 3/29/2019 - SERVPRO will clean up anything!! 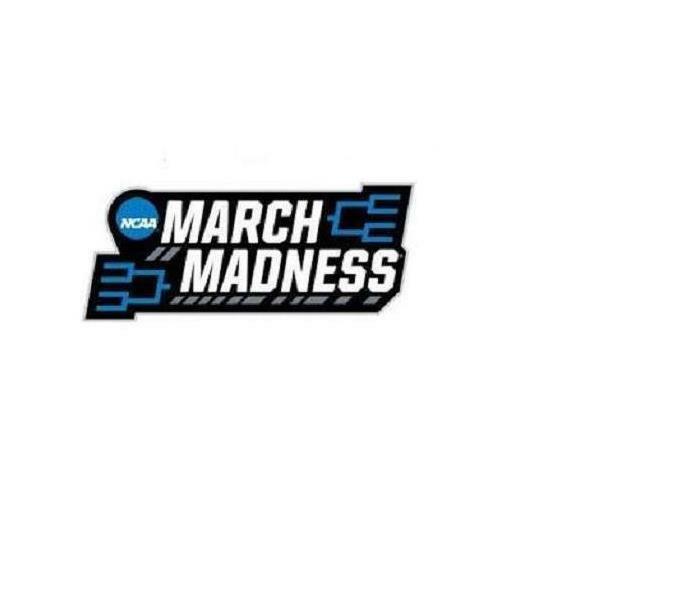 3/5/2019 - NCAA March Madness 2019 is here! 3/5/2019 - Ways to reduce water damage! 3/1/2019 - Helping out the Bay Area! !